Are you looking for a delicious vegetables recipe with a difference? If you are, you’ve found it! Here’s my italian-style spring rolls for you to enjoy. One of my favourite oriental dishes has to be vegetable spring rolls and I make it so often at home that I had to include it in my book. It’s a fantastic dish to prepare when you have parties, because you can fry them in the afternoon and then reheat them in the oven ready for your guests. 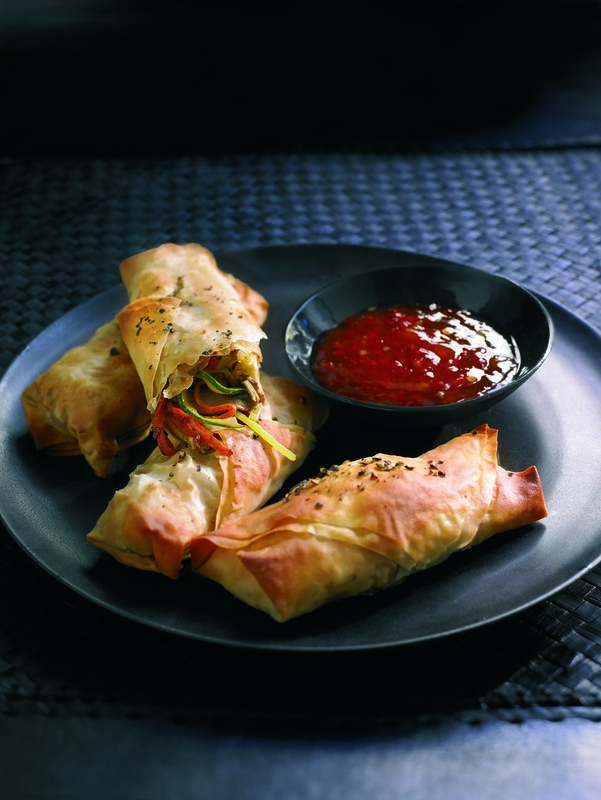 Ensure the vegetables are not too wet when putting them into the filo pastry, otherwise your spring rolls will go soggy. If you don’t have one of the vegetables, don’t panic – you can always do without. Please don’t try to make fresh filo pastry, the ready-made type is perfectly fine. Feast your eyes on the finest italian-style spring rolls! It’s straightforward and fun to make this great dish. Simply follow the instructions below and get the perfect result. Heat the olive oil in a wok or large frying pan and fry all the vegetables, the garlic and the chilli over a high heat, uncovered, for 15 minutes. Stir continuously and season with salt. Once all the vegetables are golden and soft, remove using a slotted spoon and leave to cool. Preheat the oven to 180°C/350°F/gas mark 4. Brush all the filo pastry sheets with the melted butter and stick them together in twos to make eight strong ones. Brush these eight sheets with more melted butter and share out the cooled vegetables between them, placing them diagonally across each sheet. Start to roll one corner of the filo towards the middle. When you reach the centre, tuck in the sides to encase the filling, then continue to roll up, creating a large roll. Place the prepared rolls on a greased baking tray and brush them with the remaining melted butter. Sprinkle with black pepper. Bake in the oven for about 15 minutes or until browned and crispy. 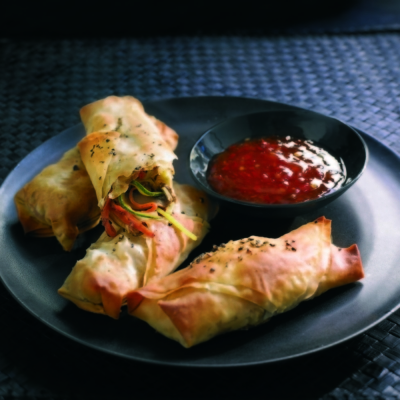 Serve immediately with sweet chilli sauce. 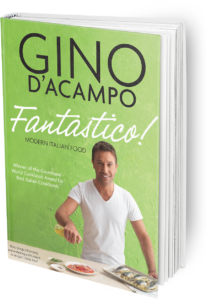 Once you’re done, simply sit back and enjoy your italian-style spring rolls and don’t forget to check out other great authentic Italian recipes including great antipasti recipes, Italian pasta recipes, Italian soup recipes, Italian beef dishes and authentic pizza recipes.